Welcome to my Articles page, which will be used as something of a blog/journal/personal thoughts-type page. Here you'll find my writings about things I like, don't like, or just find plain interesting. Read away! Missed my last chance to dress up and lie that im 14 to get free candy, once you get around 20 everything starts to go...then again, dark circles from perpetual existential stress and sleep deprivation negate the need for spooky makeup. Maybe I'll go as an 'edgy depressed millennial'. lawl. October 12, 2016 - Has it been a year already? It's been a year to the day that I posted my first article on this page, and roughly a year since I created the Articles Page itself. As you can guess, it takes quite a while for me to figure out what to write seeing as this is only my second article post after a year. My life isn't really especially interesting, nothing really "daily post worthy" occurs in my day-to-day life, (it doesn't help that I live in a rather vapid small town of less than 3,000 and have few friends ;_;) so don't be suprised that I rarely update this blog. I guess I could update the site more, like post some more art or something, but then in addition to writer's block sometimes I have artist's block....I've been thinking about putting some animated works on the site in the future, but that's halted until further notice until I can get my animating setup completed...which I'll detail later in another article that certainly won't take as long as this one to come up. October 12, 2015 - Color isn't "tacky"
I've heard it said about websites, clothing, and interior design, that somehow, use of assorted colors is "tacky" or "gaudy". I disagree with this. Color is beautiful, and adds an element of attractiveness to its applications. Since the past decade, I've noticed a trend in many websites where something previously vivid and eye-catching would be replaced with something vapid and neutrally colored. A good example of this is YouTube's channel layout, which before 2011 was fully customisable, with the option to change text colors, border colors, font styles, and background images and colors freely to one's liking. In early 2011, a new Channel layout was introduced, consisting of a far less customisable layout, with a permanently grey and white color scheme spanning all personal channels, with the only visual customisation being the ability to change your personal avatar and background image or color. I don't hate minimalism, or the use of neutral colors; in the right applications, it looks sleek and clean-cut, but its overuse is off-putting to me, especially when the color is stripped from something once vivid. 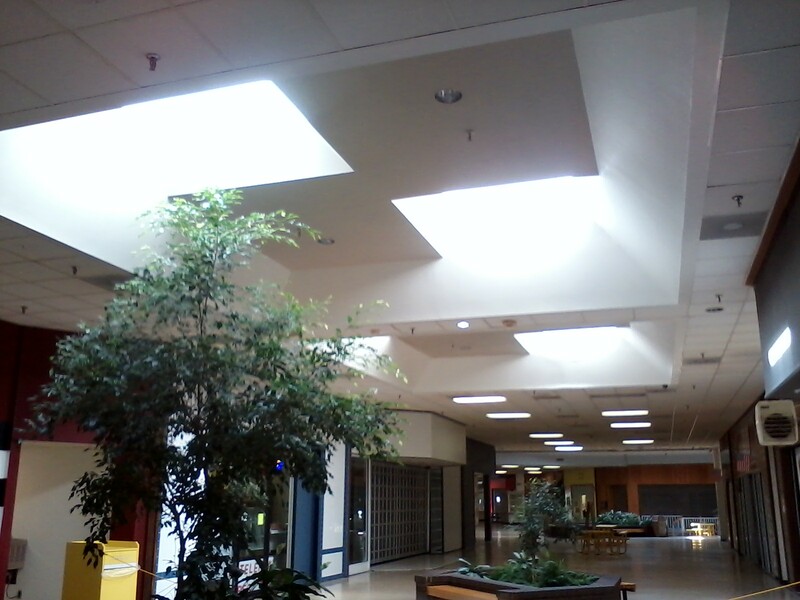 A local example of this is the Eden Mall in Eden, North Carolina. Having been built in 1980, it was decorated with vivid paint schemes, a popular element of '80s interior design. 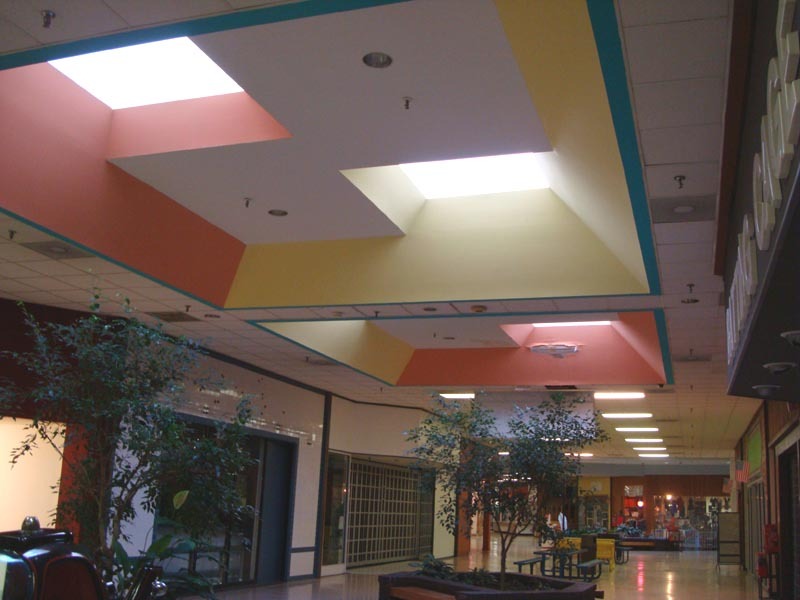 After the recession, the mall was left nearly barren, and a remodeling process began sometime in the early 2010s, where several colorful elements of the mall were painted over. Here are some pictures, the first one from 2011, showing the original colored skylights, and this one taken by me earlier today. It somewhat irritates me when cool-looking old websites are called "eyesores" because they use a lot of colorful elements, or someone is derided because their clothes don't match, or any bright-colored buildings/interiors get painted some boring color. I know this might seem like something weird to be peeved about, and I'm not sure I'm that great at writing articles, but that's just how I feel about that.